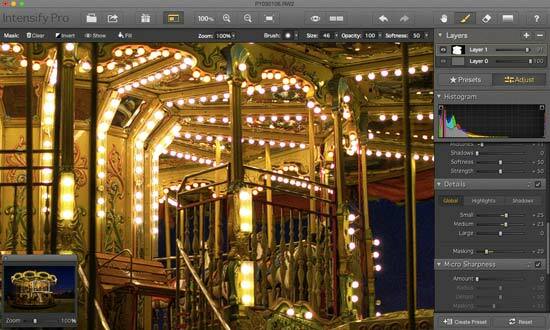 MacPhun’s new app, Intensify Pro, is designed exclusively for those with Mac computers. It is available in two different versions - a standard, which will set you back £13.49, or a more advanced “pro” version, which costs £34.99 and is the subject of this review. The difference between the two versions is that the pro version can be used as a plug-in for other pieces of software (such as Photoshop or Lightroom) and has a number of more advanced features, such as a micro sharpness tool and tonal range clipping. Either way, Intensify, it is claimed by MacPhun, uses “four incredible detail algorithms [to] help you get eye-popping depth that is nose-free, halo-free and full of life”. 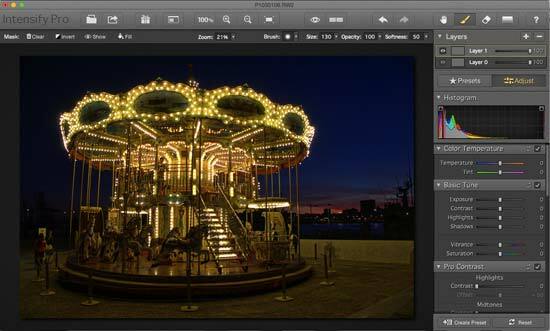 In other words, the software creates an HDR type effect, via a number of different presets which are designed to suit the subject at hand. There’s also other editing options available, including brightness, saturation and others you might find in a standard editing program. The app is aimed at photographers “of all skill levels”. MacPhun’s new app, Intensify Pro, is designed exclusively for those with Mac computers. 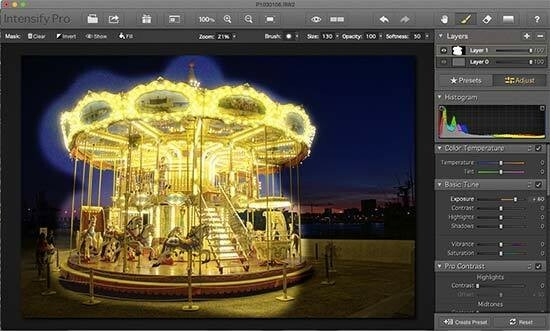 In other words, the software creates an HDR type effect, via a number of different presets which are designed to suit the subject at hand. There’s also other editing options available, including brightness, saturation and others you might find in a standard editing program. The app is aimed at photographers “of all skill levels”. To get the software, all you need to do is download it from the MacPhun website. When you first load up the software you’ll be prompted to either enter an activation code, purchase the software or continue your trial. If you’re not sure which version will be best for you, or if you’re going to enjoy the effects that the software creates, it’s recommended that you give the trial a go first. Once you’ve purchased the software from the website, you can simply enter the activation code to continue using it as a full product. 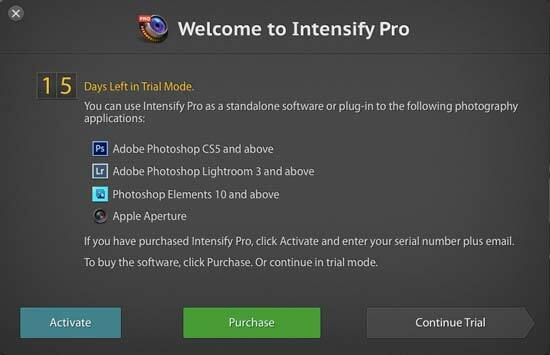 The first time that you load up the software you’ll be asked if you want to add Intensify as a plugin to any other software you have installed on your Mac, such as Photoshop, Lightroom, Aperture or Elements. This takes just a couple of seconds and if you change your mind, you can uninstall (or install those you didn’t install before) plugins at a later date. 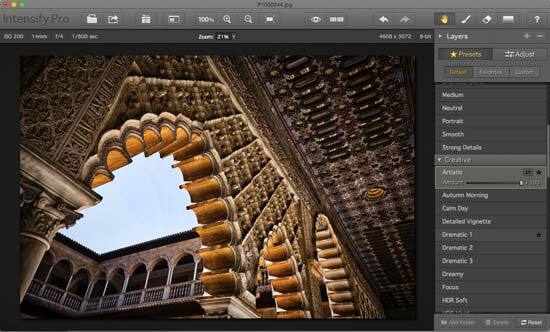 MacPhun’s claim that this software is designed for those with different skill levels is reflected in the different tabs which you can use on the software. If you’re an amateur, or just want something uncomplicated to use, you can stick with the presets, while those with some experience, or looking for something more advanced can use the Adjust tab to make more complicated changes. After you’ve opened an image - which you can do either by navigating to its containing folder or by dragging a folder onto the Intensify window - you’ll see that there are a range of options available to you. The first thing you’ll probably want to do is experiment with the Presets which can be found along the right hand side of the window, Here there’s an interesting range available, some which will be particularly suitable to different kinds of subject - such as architecture. There are also options to switch to monochrome, and if you scroll down the options there’s other options for landscapes, or to remove noise from your image. You can click a star icon on the left hand side of any preset to add it to your favourites list - which is useful if you find one that works well with a certain type of picture that you want to use often. Once you’ve found a preset you like, you can either leave it entirely up to the software to make all the changes - each will be applied in real time as soon as you click on a preset, or you can head to the Adjust tab to make tweaks. Any time you want to see how your image compares with the original, you can simply hold down an eye icon at the top of the screen - when you’re doing this, the original will be displayed, let go and the edits will become apparent. You can also press another icon which will display both versions of your image side by side, which is useful if you’re making a lot of changes. Other useful icons at the top of the screen include the zooming in and out buttons, and one which will immediately show your image at 100%, and another which will make it fit on screen. You can also keyboard shortcuts, just like you would with Photoshop, Cmd and +/- to zoom in and out, or Cmd and 0 to fit all on screen, so if you’re coming from a Photoshop background, you should feel very at home here. Just next to the 100% icon, you’ll see another which looks like a window within a window. Click this and you’ll be able to zoom in but see the whole image in a small box in the corner of the screen - helpful for navigating around the scene without having to zoom in and out all the time. Going back to the Adjust tab, here you have quite an extensive array of different settings which you can change, including Colour Temperature, Saturation, and a couple which are only available in the Pro version, such as Micro Sharpness. Once you’ve made any of these tweaks to a preset via the Adjust tab, you can save it as a custom preset - helpful if you’ve got a lot of photos that you want to apply the same look to. You can create Layers, which is useful for layering up different effects, or for only applying a certain effect to a part of the image. To create a new Layer, you simply expand the Layers section on the right hand side of the screen, and click the plus icon. To make a Layer Mask, you select the brush icon and paint on the picture around the area you want to mask. If you’re a little generous with the brush, you can select the erase tool instead and fine tune your selection - it’s also possible to change the size and opacity of either of these brushes to make it easier to finely select something. 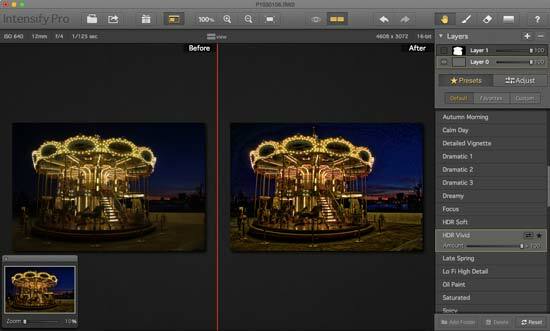 If you want to use Intensify as a plug in for something like Photoshop, that’s also very easy to use. If you’ve got Photoshop CC installed, simply open the photo you want to work on, and then go to Filter > MacPhun software > Intensify Pro. Once you’ve made all the edits you want to in the Intensify window, you press the Accept button and you’ll be taken back to your photo in the Photoshop software.